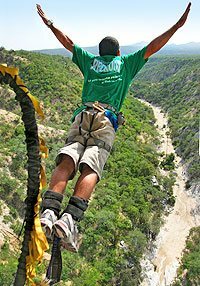 If just one awesome adrenaline rush isn't nearly enough for you, check out these extreme adventure combo discount tour packages! All the adventures on this page take place at the same location, so since you're already there, you might as well make a day of it and experience some thrilling extreme activities and save some more money! Make this vacation in Cabo San Lucas something to really remember! Choose From: Bungee Jumping, Zip Lines, ATV Tour and Sling Swing. Three times daily at 9:00 AM, 12:00 PM and 3:00 PM. A 10:30 AM time slot is also available just for cruise passengers. Green Zebra is not available on Sundays. Depends on the activities booked. Complimentary Pickup and Dropoff at Your Hotel, the Cruise Pier in Cabo San Lucas (10:30 AM time slot only) or at the canopy office on the marina. Hotel and Cruise Ship Pickup and Dropoff (in most cases), Expert Bilingual Guides, Safety Briefing, Equipment for your tour, Use of Restaurant and Bar Facilities and Water. If you book the Green Zebra combos you also get lunch included. For safety reasons, people with a history of respiratory or cardiac problems, hearing difficulty or osteoperosis and pregnant women are not permitted on these tours. Guests must be able to walk in mountainous terrain for up to 15 minutes. Weight limits apply depending on which activity booked. For your own safety, we don't allow cameras during this tour, only before and after. Per Person. Includes Zip Lines & Extreme Bungee. Per Person. Includes Zip Lines & Extreme Sling Swing. Per Person. Includes Zip Lines, 1 Bungee Jump, and 1 Swing. Per Person. Includes Zip Lines & 1 ATV (solo). Total Cost for 2 People. Includes 2 Zip Lines & 1 ATV with both people sharing one ATV. Qty is the number of combos you want. These combos are full versions of the above tours, just at an even more discounted price!